The rise of the smartphone will see mobile voice over internet protocol (VoIP) calls rise dramatically from 15 billion minutes in 2010 to a massive 470.6 billion by 2015, and potentially damage traditional mobile operators in the process. Juniper Research suggests that VoIP – including services like Skype – will go through explosive growth in the next five years, with mobile service providers likely to suffer. Of course, with mobile servers getting rid of unlimited data packages, they are already beginning to mitigate the potential damage through 3G networks, but VoIP through WiFi could well bite into the amount of calls made through the existing phone infrastructure. "There are several flavours of mobile VoIP," said Anthony Cox, Senior Analyst at Juniper Research. 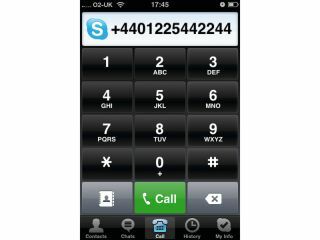 "WiFi mobile VoIP is potentially the most damaging of all VoIP traffic as it bypasses the mobile networks altogether. "We forecast that mobile VoIP over WiFi will cost operators $5 billion (£3.35bn) globally by 2015." Juniper suggests that we will see traditional mobile operators 'bury the hatchet' and forge partnership with VoIP services, echoing Verizon's deal with Skype in the US. "Even though a major operator, 3UK, touts the benefits of mobile VoIP, it will take some time for many operators, particularly in emerging markets, to accept it, since it represents loss of control over their own networks," adds Cox. We're relatively certain that mobile networks will come out smelling of roses, regardless of the changes.